‘It’s an EYE-SORE!’ was an interesting description of the Les Sauvages de la Mer Pacificique wallpaper print in our Upper Grey Gallery. Joshua Good, one of our three Outreach Programme interns, was commenting on the print of a section of the 1804 wallpaper designed by Jean-Gabriel Charvet and manufactured by James Dufour which is one of the works in our Printing the Pacific exhibition curated by Assistant Curator Mathew Norman. Charvet and Dufour would never have dreamed that 187 years after producing their wallpaper, which was relished by the European and American bourgeoisie of their day, was now described as an ‘eye-sore’ by a descendant of the ‘inhabitants of Tonga’ who are fancifully depicted in the imperialist work. Neither would they have imagined that it would become the catalyst for artist Lisa Reihana’s acclaimed work, in Pursuit of Venus [infected]. Observing these gallery works as a starting point for enquiry was just one of the activities participants of the Outreach Internship Programme completed at the end of the first semester for Manukau Institute of Technology (MIT). When the opportunity arose for our Outreach Programme to collaborate with MIT’s Faculty of Arts Department, we responded immediately! The Bachelor in Creative Arts professional practices module was a perfect match for our Outreach Programme, and enabled us to utilise the internship model to work alongside local tertiary art students with Outreach work in Otara at the local school, only five minutes away from MIT, Sir Edmund Hillary Collegiate Senior School. Under the tutelage of MIT lecturer and artist Steve Lovett, third year BCA students Joshua Good, Kylie Epapara and Roberta Ellis completed a 10-week internship with us. This included being based at the Gallery as well as being placed with Sir Edmund Hillary Collegiate Senior School assisting Art teachers Mose Eteuati and Loa Toetu’u. When I started this internship, I was unsure where to go. In the beginning, I was very nervous because it was a new place and I was also needing ideas for a final year art project with MIT. Four weeks into my internship I met the Senior School art students on my Outreach community placement with Sir Edmund Hillary Collegiate Senior School in Otara. I learned from that experience that working alongside these Year 10 & 13 students wasn't that hard. By working with them and travelling back and forth, between MIT, SEHC and Auckland Art Gallery I had the opportunity to experience something new! My name is Kylie Epapara. I’m a student at Manukau Institute of Technology (MIT) in the third and final year of my Bachelors in Creative Arts. I applied for this amazing experience after meeting the Outreach Programme Coordinator at Auckland Art Gallery. 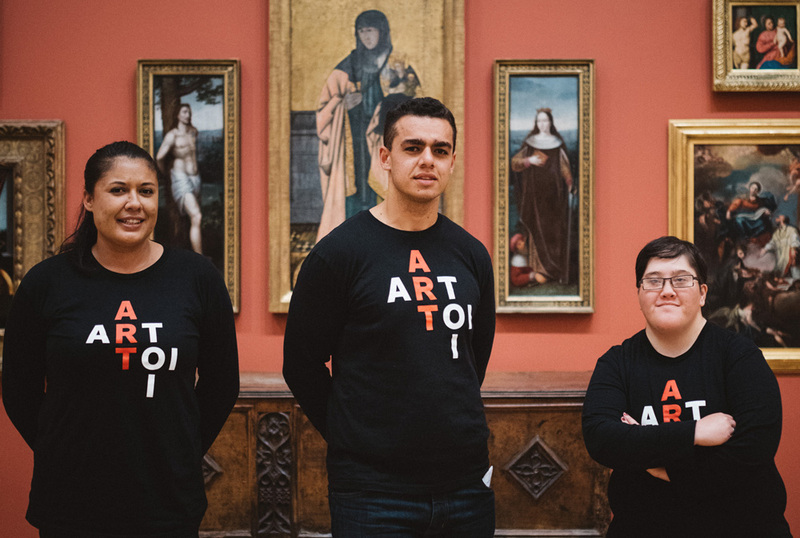 This internship was designed to give MIT students on-the-job work experience in which we were given mentorship from staff at the Auckland Art Gallery and were placed in one of their Outreach Community Programmes. In this case, it was at Sir Edmund Hillary Collegiate’s Senior School Art Department working under Mose Eteuati, the department head, and the art teacher, Loa Toetu’u, and with their Year 10–13 students. I am so grateful for this opportunity and found everything very informative. The staff at the Auckland Art Gallery are very friendly and knowledgeable people who have so much to offer the Auckland community. My highlight was being shown through the back-of-house areas of the Gallery and being able to have a more personal experience with the art. Over the last 11 weeks I enjoyed being a part of the Gallery Outreach team and our placement at Sir Edmund Hillary Collegiate made it clear that my future is in teaching! I’m looking forward to my journey and working with New Zealand’s future artists. 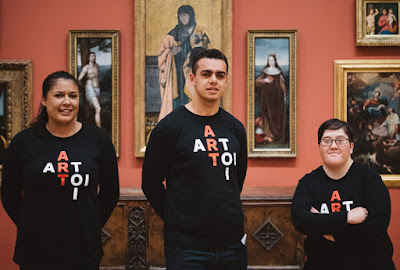 My experience with the Auckland Art Gallery’s Outreach Internship Programme was a very positive one! I had the opportunity to do things that I hadn’t had the chance to do before. Things such as planning, preparing and presenting about myself and my art in front of various-sized audiences. This ranged from presenting at a local high school in front of 40+ art students during my Outreach community placement to speaking behind a podium with a microphone in Auckland Art Gallery’s Auditorium to industry professionals! As well as this, I also had a couple days in a real classroom environment helping out art students with their work. I got a lot more out of this internship than I expected and the team that orchestrated it did a stellar job at making everything run as smooth as it did!